“Local color” is a term used by artists to describe the “true” color of an object seen in daylight and separated from everything else. In fact, color is usually perceived—and subtly altered—by the colors that surround it. 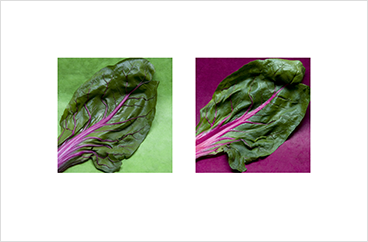 Using the flowers, fruits, and vegetables from local gardens and markets, these images take a playful look at color relationships while acknowledging that we need to pay attention to what is in front of us—everything is local. Each image is produced in a limited edition of 50 archival pigment prints, photographed and printed by the artist. All images are printed on acid free art paper and framed using museum quality conservation materials, including UV filtering non-glare acrylic. The color of the wooden frame is burgundy. Frame outside edge 11" x 22½"